Obesity is at epidemic levels throughout America. It is estimated by the Florida Department of Health that 57% of Floridians are either overweight or obese. It is also widely recognized that obesity is associated with a number of serious diseases such as type II diabetes, hypertension, sleep apnea, osteoarthritis, infertility and elevated levels of cholesterol and triglycerides. Obesity is also the leading cause of preventable death after lung cancer in the US. Riverside Surgical and Weight Loss Center was established over 2 years ago with the vision of helping people realize their goals of significant and lasting weight reduction through minimally invasive bariatric surgery. We are proud to offer a full array of the latest and safest medical technology in bringing about weight reduction. As a board certified surgeon, specializing in bariatrics, Dr. Domkowski is privileged to offer both primary surgery for weight reduction as well as conversion and revisional surgery for patients that have already had a weight loss procedure and would like it converted to another type of operation. 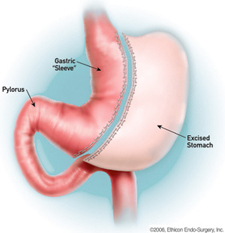 For example, someone that has had a gastric bypass and then experienced weight regain, may be a candidate to have a laparoscopic adjustable gastric band placed on their gastric pouch. Dr. Domkowski is committed to keeping up with the latest advances in bariatric surgery and attends several meetings annually. He does this not only to keep up with the more current information, but also so that the latest technology can be offered to his patients. He recently attended the 3rd annual International Laparoscopic Sleeve Gastrectomy Summit in New York. A highly effective weight loss surgery is the laparoscopic sleeve gastrectomy, (LSG) also known as the vertical sleeve gastrectomy. Through five small incisions (between 0.5 and 1 inch) 85% of the stomach is removed. 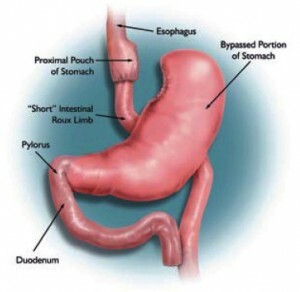 This transforms your stomach into a long tube or a “sleeve” similar to your shirt sleeve. According to the American Society for Metabolic and Bariatric Surgery and the National Institutes of Health, Roux-en-Y gastric bypass is the current gold standard procedure for weight loss surgery. 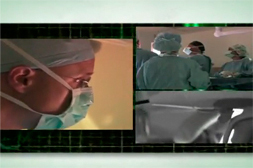 In this procedure, the surgeon uses a stapling device to create a small (30 cc) stomach pouch. The remainder of the stomach is not removed, but is completely separated from the pouch. The biliopancreatic diversion with duodenal switch (BPD/DS) is a combined surgery that makes your stomach smallerand bypasses part of your small intestine for the best-reported, long-term percentage of weight loss.